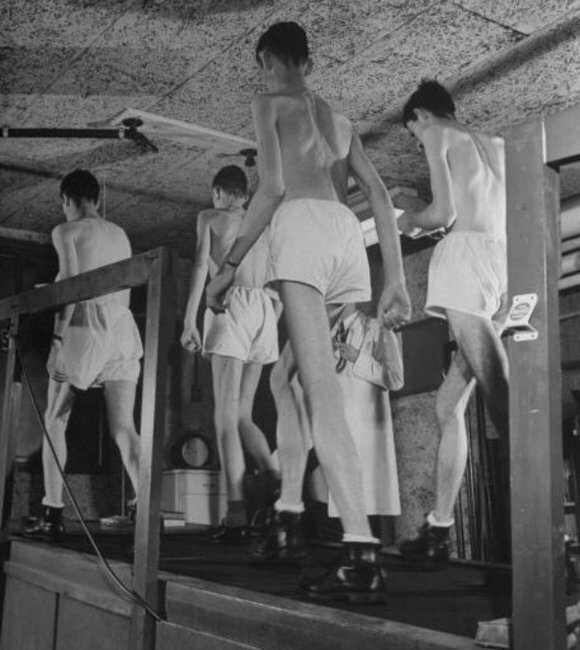 “Thirty-six men were chosen for the experiment, which was led by physiologist Ancel Keys at the University of Minnesota. For the first three months, they were given a normal diet, including bacon, eggs, roast beef, mashed potatoes and chocolate sundaes, totalling 3200 calories a day. Then, for the next six months, their diet was cut to a semi-starvation level of 1560 calories a day. Their meals were bland, mostly bread and vegetables such as potatoes, turnips and cabbage. The changes in the men were dramatic. For starters, they became obsessed with food, thinking and talking about it endlessly. They lingered over their meals – playing with their food, mixing it together in strange combinations, or holding mouthfuls for a long time before swallowing. Some collected recipes. To feel full, they would smoke, drink massive amounts of water or endless cups of coffee, or chew gum – one man getting through 40 packs of gum a day. The men had to keep active and walk 35km a week. But they lacked energy and withdrew into themselves, preferring to watch movies alone rather than socialise. “They were men who postponed their living, while they endured their awful present,” wrote Keys and his fellow researchers. We should not underestimate the effect of sudden or extreme weight loss, or restriction of eating. Many people assume (wrongly) that these sorts of effects will only occur if you are underweight, but in reality, these sorts of effects can also be visible in someone who is above the healthy weight range but excessively restricts their calories. If you have ben trying to lose weight and have noticed that there have been significant changes in how you feel or act, it might be time to talk to a health professional about what’s going on for you. If you have a loved one whose behaviour has changed and you know they have been restricting their food intake, perhaps you could have a gentle conversation about whether they are losing weight in a healthy manner. Maintaining a healthy weight is really important, but getting there “at any cost” is not a good idea. Previous postConfused by the different terms that describe pregnancy loss?